Our first night cycle touring in Serbia was spent in a tiny farmhouse with an elderly Serbian couple that invited us into their home. 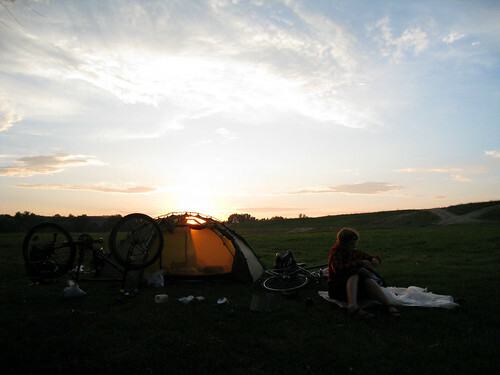 This set the tone for the rest of our cycling in Serbia with many warm and hospitable encounters along the way. In Belgrade we were given a cycle tour of the city and hosted by Aleksander and Milica enjoying their company and conversation until late into the night. The Danube cycling saw us experience some ups and downs with a number of equipment failures all within one 48 hour period accompanied by a number of spontaneous acts of kindness from strangers that more than made up for any problems. Our day of food in Serbia resulted in a food enduced coma for Emma and a resolution to never eat a family pack of Baklava in a single sitting again. This map shows the route we cycled through Serbia. To see full details of where we have cycled, take a look at our full route map.